BELISARIO (Belisarius) is a tragedia lirica. Luigi Marchionni's adaptation of Eduard von Schenk's(de) play, BELISARIUS, first staged in Munich in 1820 and then (in Italian) in Naples in 1826. It premiered to critical and popular success on 4 February 1836 at the Teatro La Fenice, Venice, and was given many additional performances that season, although Donizetti scholar William Ashbrook notes that there would have been more had the opera not been presented so late in the season. However, in spite of its initial short term success and critical reaction, as represented by a review in La Gazzetta Privilegiata which stated that ‘A new masterwork has been added to Italian music.....BELISARIO not only pleased and delighted, but also conquered, inflamed and ravished the full auditorium’, in the long run, had ‘Donizetti poured music of the caliber of his LUCIA DI LAMMERMOOR into the score of BELISARIO, the shortcomings of its wayward plot and dramatic structure would matter less’. 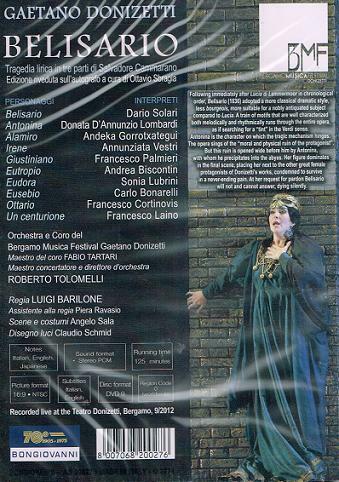 With the success of LUCIA DI LAMMERMOOR in September 1835, Donizetti moved on to stagings of MARIA STUARDA, the first under that name at La Scala in late 1835. He had signed the contract in July 1835 to present BELISARIO in Venice, for what would be the first visit to that city since 1819, but it was not until October that the subject was finally agreed upon. 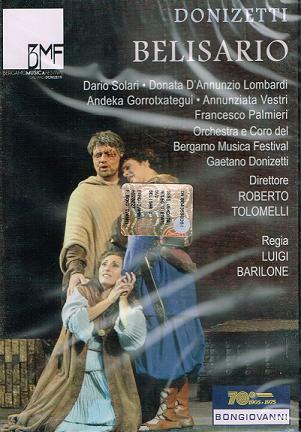 By the time of the first performance, which was well received, Donizetti reported to his publisher the audience's reaction to most of the numbers, specifically that ‘in the duet for Vial and Salvatore, many shouts of bravo, but at the end (so they say) the situation is so moving that they were weeping.